The standard 12-inch POC was designed to support movement of waste materials from the Rocky Flats facility. It consists of a 12.8-inch outer diameter stainless steel pipe positioned by fiberboard/plywood dunnage within a 55-gallon drum with a rigid liner and lid. The pipe has an internal height of 27.5 inches to accommodate waste material contents. The dunnage provides structural support to maintain the pipe in its designed configuration within the outer drum. The total assembly weight varies depending on the dunnage used but is in the range of 420 pounds. 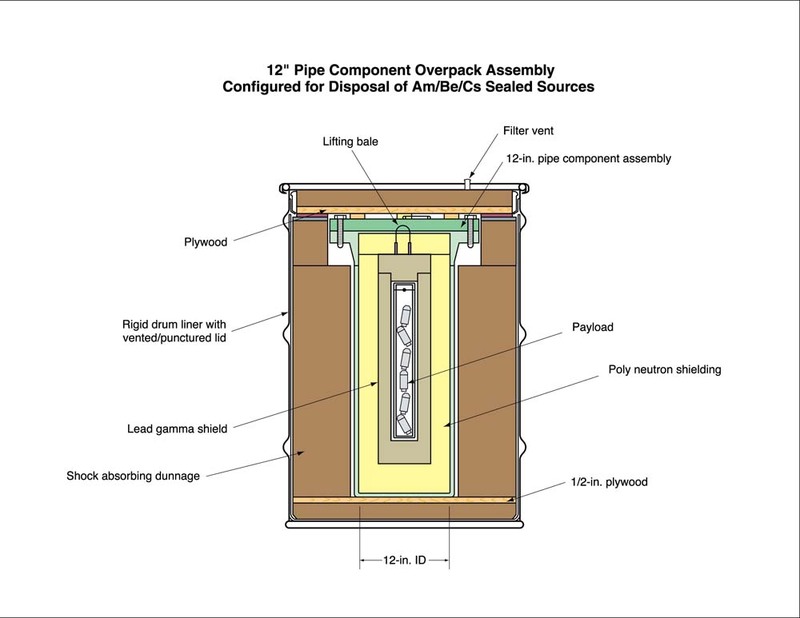 The container is routinely used by OSRP for packaging and transportation of sealed sources containing Americium-241, Plutonium-238, and Plutonium-239. It is approved for use in the TRUPACT-II container for transportation of waste for disposal at the Waste Isolation Pilot Plant (WIPP). Performance or procurement details are available from the OSRP staff, simply call Justin Griffin at 505-606-0362.